From information provided by Christine Litchfield and other on-line researches. Also see Charcott for photographs. 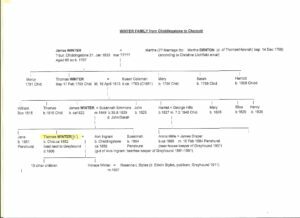 Much of the information in the family trees above comes from researching the 1841-1911 censuses for Chiddingstone and Charcott and the Family Search website. Christine Litchfield’s father was Frederick George Hobbs: his date of birth was 18 December 1898 (1939 Register) his birth registered at Sevenoaks 1899 (Civil Reg. Indexes). He died in 1962 (Civil Reg. Index for Tonbridge) aged 63. Her mother was Vera A Winter, date of birth 3 July 1910 (1939 Register) at Charcott: her parents were Horace Winter and Rosanna Lavinia Styles. According to the 1939 Register Frederick is described as a permanent wage labourer; and Vera as a domestic servant. According to Christine Litchfield, Vera’s grandfather – Edwin Walter Styles, took over the pub at Charcott in 1905/6. Rosannah Lavinia Styles, Edwin’s daughter, was a cook and she married Horace Winter in 1883 – he was a thatcher. The 1911 census says that Florence Hobbs had one child, living – searching for this child, there was registered at Sevenoaks a Ralph Riches Hobbs born in 1905. On searching for him in the 1911 census he is living with his grandmother Eleanor Elizabeth Riches, a widow at Deal, along with Dorothy Hobbs, aged 10. Other ancestors of Christine Litchfield were the STYLES and the WINTER families – both were large families, living at Charcott, although not originally from Charcott. 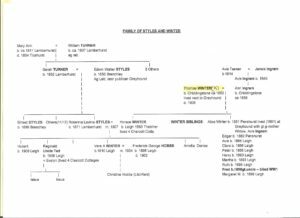 *From information from Christine Litchfield we know Ernest Styles is a relative: research shows he was the brother of Rosa (Rosanna Lavinia). Rosa Winter’s full name was Rosanna Lavinia Styles. Horace Winter was the son of Thomas Winter. 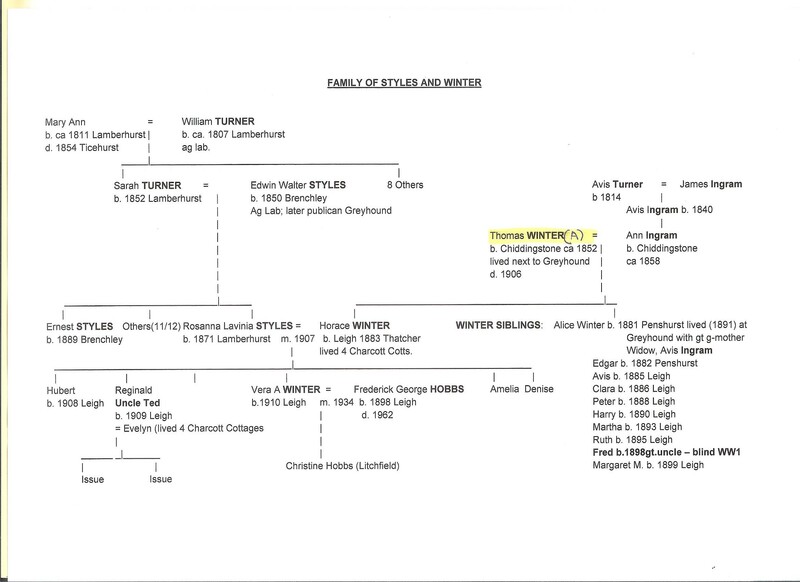 Thomas Winter (b. ca 1851 Chiddingstone, son of James and Susanna Winter – James is a thatcher) and his wife, Ann, lived next to the Greyhound in the 1891 census and 1901 census. According to Christine Litchfield, the Winter family were from Wellers Town. In 1871 Thomas is given as a wood hoopmaker and is still living with his parents at Penshurst in Workhouse Cottage. By 1881 he is married and living with his wife, Ann, and daughter Alice at Wellers Town, nr Penshurst. By 1891 they are at Charcott, Leigh with their ever expanding family, although their daughter Alice is actually living with her great-grandmother, Avis Ingram, at the Greyhound at Charcott. In 1901, Thomas Winter becomes a general labourer on a farm. 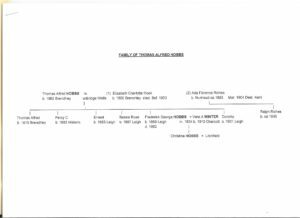 It appears from the Civil Registration indexes that Thomas probably died in 1906. Searching the censuses for Avis Ingram, we find her in 1851 at Chiddingstone Hoath with her husband James and family, aged 38. (Her marriage is found at Westerham, 1832 – James Ingram and Avis Turner) In 1861 she is a widow, running the beer shop, the King’s Arms, at Causeway, living with her unmarried daughter Ann, aged 20, and her granddaughter Avis Ingram, aged 3. In 1871 she is now 57 running the Greyhound at Charcott, still with Avis and her granddaughter Ann. In 1881, she is still there; 1891 she is still there but has her great-granddaughter, Alice Winter with her, living next door to Thomas Winter, Ann and family. By 1901 Avis is no longer there – but cannot find a death entry for her, only for an Ann Ingram b. ca 1814 in 1892 Sevenoaks). In 1901 the Greyhound is run by Annie Draper, aged 38. Further research shows that Annie Draper was born Annie Hills, the daughter of Harriet Winter and George Hills. 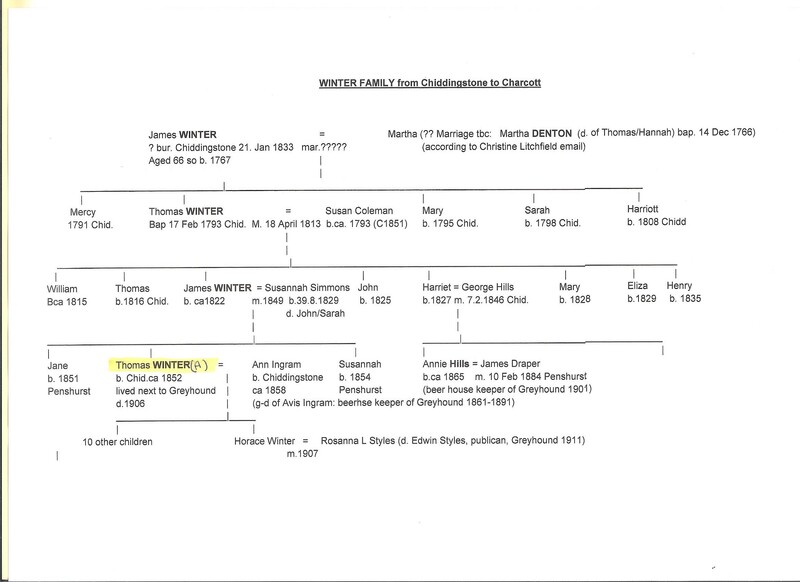 Harriet Winter was sister to James Winter and the aunt of Thomas Winter (see family tree above). Hence Annie Draper and Thomas Winter were cousins. However, in 1911 the Greyhound is run by Edwin STYLES – another ancestor of Christine Litchfield. The Greyhound – beerhouse – was therefore in the same family from at least 1871 until 1911 and beyond. At Brenchley the family lived at Knowle Cottage. They lived at Brenchley until at least 1901. Edwin was initially an agricultural labourer; in 1901 he was a farm bailiff. By 1911 he was retailer of beer at the Greyhound, Charcott – with just his wife and two younger children living with them. The census states they had 14 children of which 12 were living: below are given 13 from various censuses – another one of those named must have died before 1911. At Brenchley you can trace find Edwin’s parents, siblings and possibly trace the family further. Edwin STYLES married Sarah TURNER in 1870 (marriage registered at Ticehurst). There first two children are born at Lamberhurst (where Sarah was born) before they moved to Brenchley. 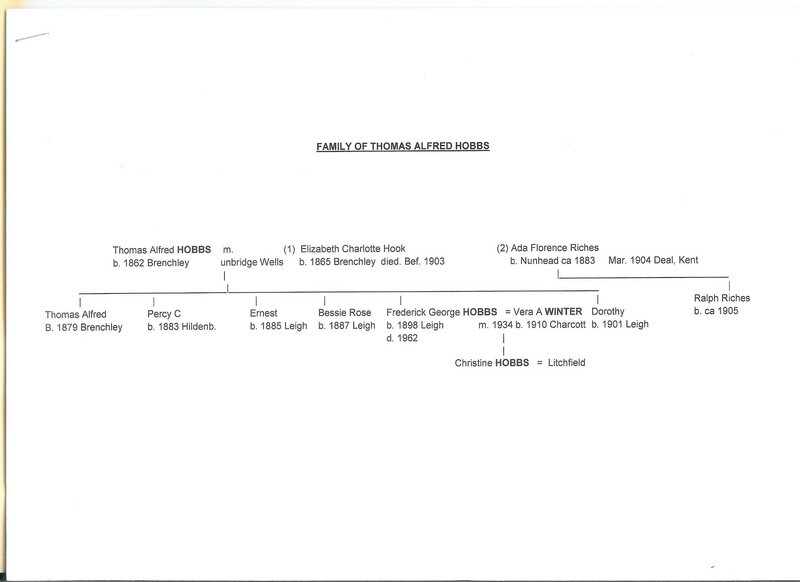 Sarah Turner’s family: information is available via the censuses. Her parents were William Turner of Lamberhurst, an agricultural labourer and Mary Ann, also born Lamberhurst. By 1861, however, William was a widower. (Mary Ann death’s is probably that registered in 1854 at Ticehurst). And from the 1861 census (at Hook Green) we can move back another generation and see that William’s father was also an agricultural labourer, born in 1784 at Frant, by 1861 a widower also. (The 1841 census gives this William’s wife as probably being Sarah with another possible son of theirs being John). There is a lot more information about these families that can be obtained from the on-line sources available – as well as from visiting the relevant local record offices.